The Mullum Creek DRC will be taking its annual break from 22 December 2017 to 21 January 2018. No design support or review work will be undertaken during this period. However from 8 January onward, we will be available to answer queries regarding homes under construction on the estate (call 03 9480 0605), and we will continue to conduct site visits and inspections. For those who have not yet begun the design process, over the past few months we have put together an External Style Guide, a collection of beautiful design images with commentary on material, form, colour and texture. A building that shows architectural interest and blends within the surrounding environment is an integral part of the Mullum Creek vision. 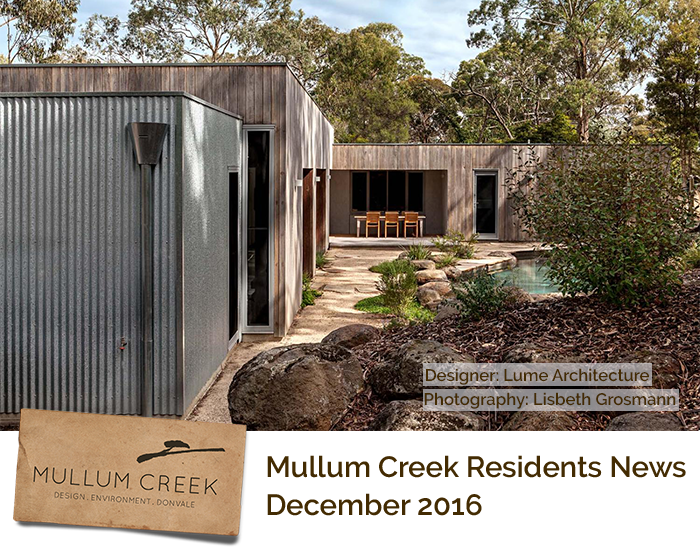 Although not all of the images used in this Guide are completely aligned with the Mullum Creek Design Guidelines, all have design elements which could be used for a Mullum Creek home. To view the External Style Guide, click here or visit the Mullum Creek website. We’ve recently received a request from John Watt, an OH&S officer at Australia Post, asking us to inform residents about Australia Post’s delivery requirements to residential addresses. Below are examples of potential letterbox arrangements. In each case it is important that the letterbox is within immediate reach from the driveway or footpath. Public Forums – which have hosted talks by Katerina Gaita (Director of Climate for Change), David Karoly (Professor of Atmospheric Science, University of Melbourne) and John Wiseman (Professorial Fellow, University of Melbourne).